Relational and Body-Centered Practices for Healing Trauma provides psychotherapists and other helping professionals with a new body-based clinical model for the treatment of trauma. This model synthesizes emerging neurobiological and attachment research with somatic, embodied healing practices. Tested with hundreds of practitioners in courses for more than a decade, the principles and practices presented here empower helping professionals to effectively treat people with trauma while experiencing a sense of mutuality and personal growth themselves. Sharon Stanley, PhD, is an educator and psychotherapist in private practice on Bainbridge Island, Washington, where she also develops and facilitates courses on Somatic Transformation, a two-year curriculum for healing trauma. 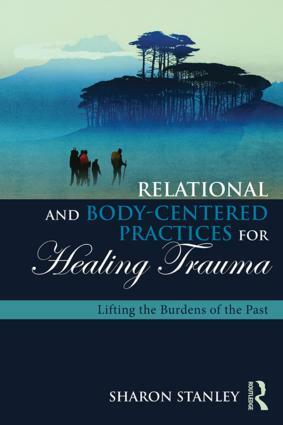 "Relational and Body-Centered Practices for Healing Trauma is a remarkably compelling blend of interdisciplinary theory and applied case material. The science is accurate, and the clinical material is absorbing. Sharon Stanley’s integration of anthropological and cultural material with relational body techniques is unique. This book will have an indelible impact on the field." "Sharon Stanley has written a brilliant and comprehensive testament to the absolute necessity of including the somatic connection between the body and the brain in healing trauma. She explores the emerging literature linking the neurophysiology of the fight/flight limbic system, the autonomic nervous system, and the right-brain centers for procedural memory and modulation of arousal with techniques that re-regulate homeostasis. Detailed case studies provide a manual for specific body-based interventions. This book is a must read for therapists." "What a marvelous book! Relational and Body-Centered Practices for Healing Trauma is an amazing integration of developmental neuroscience and clinical psychotherapy. Well written and engaging, it provides plenty of examples to facilitate applied understanding in somatic healing. It will be an excellent resource for clinicians of all stripes, with step-by-step illustrations of therapeutic approaches."